Of course we know never to give up! ... We've got that down pat!...Check! ...:::Hatch good ideas. Cackle with your friends. 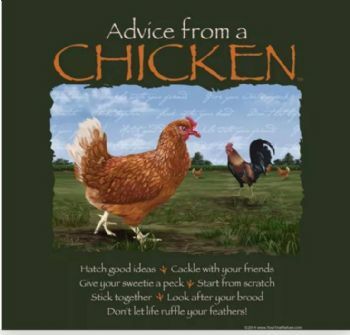 And don't let life ruffle your feathers. Like everything in life, there is a beginning and an end. Kind of like the chicken and the egg. DAY THREE: I strutted my feathers and boasted, "I am so glad i have not had a bad cold or URI in about six years ... just these allergies! ...........No sooner did i crow, then i thought i would croak with incessant hacking! FOUR DAYS LATER: lightening struck as i I developed fever and chills! ..On the day he was sent home mid-morning by his boss, he got undressed and after listening to him gasp for air, i clucked, "GET DRESSED!! ... I am taking you to Urgent care!!" We know they can't treat a virus like an URI with antibiotics BUT he was found upon examination, to have a bulging eardrum .... and was bright red! ....... (He thanked me later for hauling him down there) ... He was prescribed antibiotics and something to help relieve the cough. And being fairly sensible, i drove myself to the Doctor to make sure i did not have pneumonia or something! ..
..:::Time has a way of sneaking up on one! NO matter how corny or silly, IF you can keep a sense of humor through the storm, you will live to see the Golden sky .... So bundle up, eat your chicken noodle soup, kick back, rest, and drink lots of water and fluids. And never forget this Chicken Mc Nugget: "It could always be worse." .. When you can smile and laugh out loud again, that is a sure sign, you are going to make it after all! ..
...:::P.S. 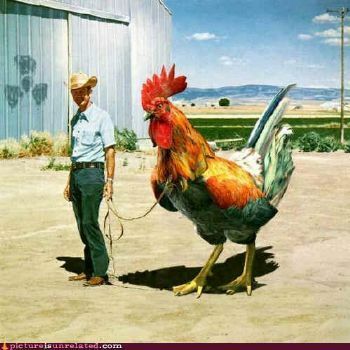 As soon as you can fly the 'coop' grab your pet and let him take you for a walk. DAY SEVEN: Status Quo .. Please accept my thanks to each of you now for reading and commenting. I am still getting a lot of much needed rest and won't thank individually as i normally do. But wait .... i can't stop without sharing this one with you too!! Excellent blog, graphics and you upbeat attitude. for sharing. You certainly are a brilliant writer.awesome blog and you made me chuckle while I was on your journey. As we get older as you know we got to keep on top of things healthwise. Glad you are heading down recovery road. Hopefully, you will both be up and ripening again in short order. I hope that by now you are feeling so much better and have kicked that virus to the curb. This has been quite a year for URI's. The one I had in January where I coughed for over a month, actually caused a hernia due to the deep coughing. 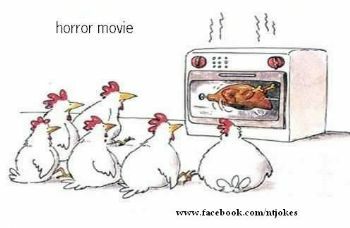 Loved your chicken cartoons...................if we lose our sense of humor, we are doomed. My husband and I can still completely crack up and it has saved many situations. 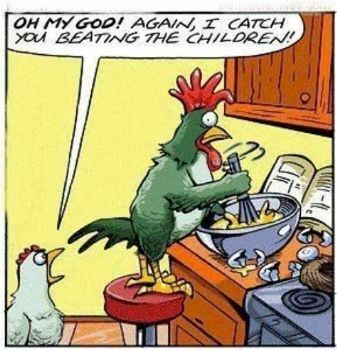 Thanks for the hen chuckles. Each cartoon was funnier and I busted out laughing on the last two. Thanks for finding and sharing! Back to the coop and under the covers till you feel better. Then educate & entertain us with another blog. on having your blog featured! your humor and wise words. on this becoming a Popular blog ... pretty creative! I missed this when you posted it, but I see you haven't lost your wonderful sense of humor! I hope you and your hubby are better this week! Sorry I missed this one when you posted it. It was hysterical as usual. I hope you are feeling better soon. So tough this time of year as the bugs keep on infecting people. Stay strong, get plenty of rest and eat your chicken soup. Big hugs and wishes for good health to return! 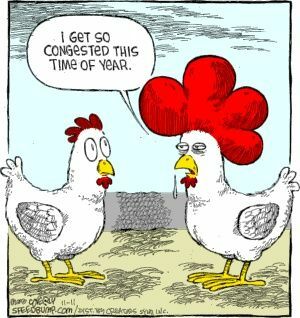 LOVE all the chicken cartoons!! Hope you and DH are beginning to feel better! 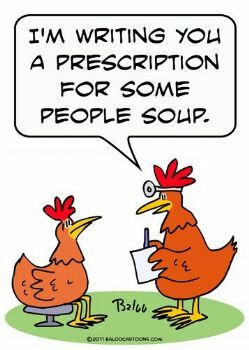 There's much to be said for the comfort of chicken soup! I had some last night, and it was heavenly!! And, I do feel better this morning!! Thanks for the giggles. Hoping you and DH feel better soon. 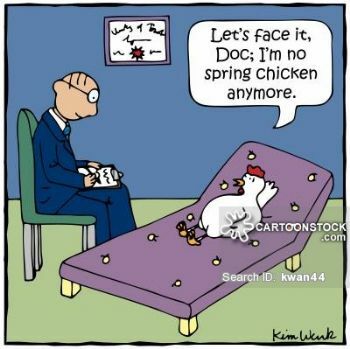 Hope next week finds you flying the coop! Hope you two feel better soon its hard when both of you are down and out no one wants to cook the soup . two pots of soup enjoy. What a great post. It made me feel better. I hope you and hubby feel better. Rest and lots of fluids really help. I just made a crock pot full of chicken noodle soup. Living alone, I freeze it in containers for later. Thanks for the laughs!! The gloomy cloud is at my doorstep, but I will okay. Take care of yourself and your husband! I love your sense of humor and as I was reading your blog I was belly gut laughing. Not at you mind you but in the presentation that you did and how you kept yourself encouraged and sane by using humor. That's so WONDERFUL!!!! Get to feeling much better, kiddo as you R E S T!!!! 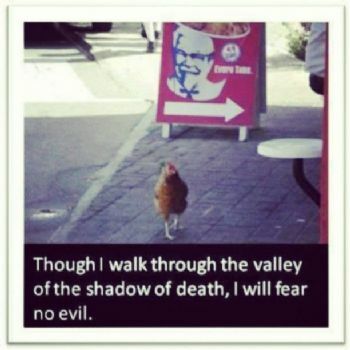 The chicken is certainly one to be wary of humans. Chicken noodle soup is the cure all!! Take care and heal. This is a very cute blog. Thank you for making me chuckle. Hope you feel better soon. Hope you both are totally well soon! What a funny and clever and blog post despite your ailing! I like how you keep a sense of humor through it all. I had pneumonia a few years ago and of course I waited forever to see a doctor until I realized I was having breathing issues between hacking. (I am forever grateful for creation of inhalers ever since that episode-what a difference!) I had this horrid voice with it where I sounded like I was even worse off than I was. A few months ago my husband developed that horrid cough/hack I know all too well and I badgered, cajoled and annoyed him into going to a doctor ASAP. He found out he had bronchitis and could have easily developed pneumonia and suddenly he appreciated my persistence. Hope you feel better real soon! You are a hero to your hubs! Keep up the great job! I love your blogs! Feel better soon Jan! I finally went to the doctor because of basically the same problem you and hubby had. It was an exacerbation of my asthma so he put me on a steroid pack. So I truly understand the fatigue and coughing bit. Cute blog. Sorry you and your husband are sick. Hope you feel better soon. This was great! I do love your sense of humor. Hope both of you start feeling better soon. Wow, what a collection. Very funny. Thanks for the giggles! So sorry you and your DH got sick, hope you will be right as rain soon! Great blog! Sorry to hear you and your DH are both sick. Take care..
Thanx for the laugh & sound advice but oh at such cost. Please, the both of you, feel better soon. Wisdom words written in a very entertaining way! !